Fountain pen people are picky. We are! And when it comes to choosing colors and materials for a custom pen, we can let that trait have free reign. Some of my customers often know exactly what they want right away, while others need a bit of guidance through the bewildering array of choices. Narrowing down the selection can take a while. Sometimes two favorite materials call out for attention, and rather than selecting one over the other, a client will resolve the issue by getting a pen in each color. And some order multiple pens in both colors. Four of this week’s pens fit that category, with the jewel tones of Conway Stewart’s Azure and Quartz Burgundy acrylics. These designs are what we penmakers call a homage, or a clone of another style, often of a pen that is no longer available, with some specific modifications asked for by the client. In this case, the original models were the Conway Stewart Churchill and Wellington, but without the characteristic bluges or curves that Conway Stewart pens often have. For the Wellington, removing the cap and barrel bulges leaves a very different pen, one that is more classic in style. The acrylics used are original CS materials, a high quality Italian resin, deep and rich in color. 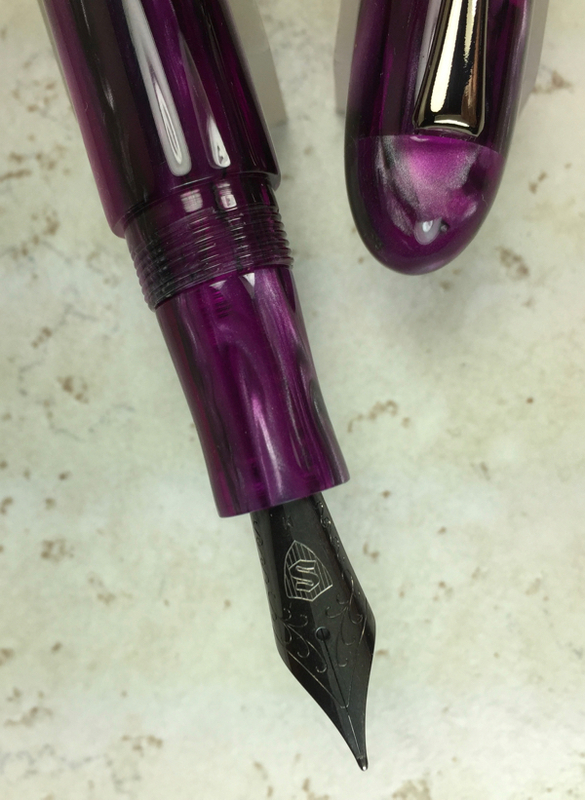 Another pen made this week also boasts a deep, rich, jewel tone color, but the transparency and swirls in the Topaz Water acrylic provide an entirely different personality. The pen is a Literati Dip Pen, fitted with a JoWo fountain pen nib and feed. They can be pulled out and replaced with a standard dip pen ferrule for use with other dip nibs. One customer likes the JoWo nibs in a dip pen for ease of testing new inks, and for ease of cleaning. This dip pen is about 7″ in length. A matching pen rest was requested to go with it. Several other pens and projects were begun this week, including a prototype, or two…or was it three? I’ve truly lost count of all the new ideas I’d like to make reality. Some will come to pass much more quickly than others. If only I could clone myself to get it all done faster! 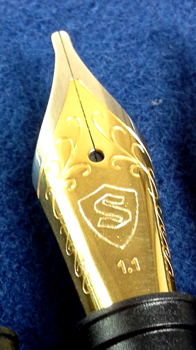 I’m delighted to announce that all Scriptorium Pens now come with our logo engraved nibs! Customers have been asking for this feature for a long time, and it’s finally available. Our logo is comprised of a heraldic shield with a stylized “S” in the center. Scriptorium nibs will now be easily identifiable and no longer have that “unbranded” look. These are still the same high-quality JoWo German nibs as always, but from now on they’ll take a detour to the engraver’s before arriving here, where each nib will be tested and tuned before going to its new home. The nibs are engraved in the USA by the talented Mike Redburn of Silver Pen Parts, who also casts our custom clips in sterling silver, brass, and bronze. Check out the Nibs page for more details.